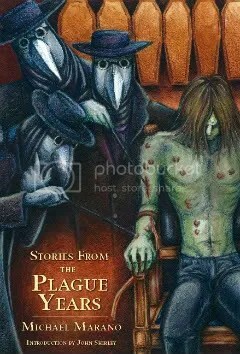 Stories from the Plague Years is the first fiction collection from award-winning fantasy author Michael Marano. Nine tales are arranged in a haunting symphony that guides readers through a tour of the darkest landscapes of human existence. Here, fury and hate grow so strong, they cannot be held within one man’s body, and manifest themselves to devastating effect. Cities contain second, unseen cities populated by the vengeful ghosts of those who died too soon. Countries fall to famine and war. But these are also the tales of love lasting beyond death, love existing beyond all hope, and friendships never forgotten. Included are the widely praised stories “Winter Requiem,” “The Siege,” and the controversial “Burden,” as well as two original novellas. Marano, acclaimed for his evocative voice, paints lush portraits both terrifying and tender, injecting even the darkest of fantasies with a punk rock sensibility and a touch of the humane. With Stories from the Plague Years, he presents snapshots of a time when our world collided with evil, sickness, and self-destruction and left behind lasting scars on those who dared to survive. Introduction by John Shirley. Interior illustrations & jacket design by Gabrielle Faust. –Tananarive Due, American Book-Award winning author of Blood Colony, The Living Blood and My Soul to Keep. CLICK FOR PRE-ORDERING INFO FROM CEMETERY DANCE!